Exalt Creative Group provides sound support for wedding receptions as well. Small, intimate setting? We have it covered. Large room with even larger personalities? Our equipment can accommodate crowds of up to 2,000 people. We specialize in web video for the professional community, A/V production for ministry and education, and real estate virtual tours. Call us if you want to capture that speaking engagement or training event on video! Let your brand shine through with an increased web presence, social media integration, business printing and more. Our dedicated in-house designers can work with you for that perfect look! 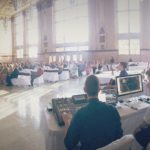 Need sound support or sound engineering for a live event? From corporate events and small concerts to youth camps and wedding receptions, our services provide high quality sound for crowds of 50 – 2,000 people. Preparing for a trade show, enhancing your customer’s website experience, or need to stock up on business printing? We leverage our media services, corporate communications and printing experience to make the most impact for your brand!